When I said I was done with larger pieces for a while, I was clearly lying to myself. Oversized watches are fantastic pieces to work on and learn from. Once you get past just how dangerous the larger mainsprings can be, and gain a healthy competence for uncoiling said mainspring safely (I do it by feeling with my hands under the bench to prevent anything from flying about), these are amazing pieces to service and see in action. 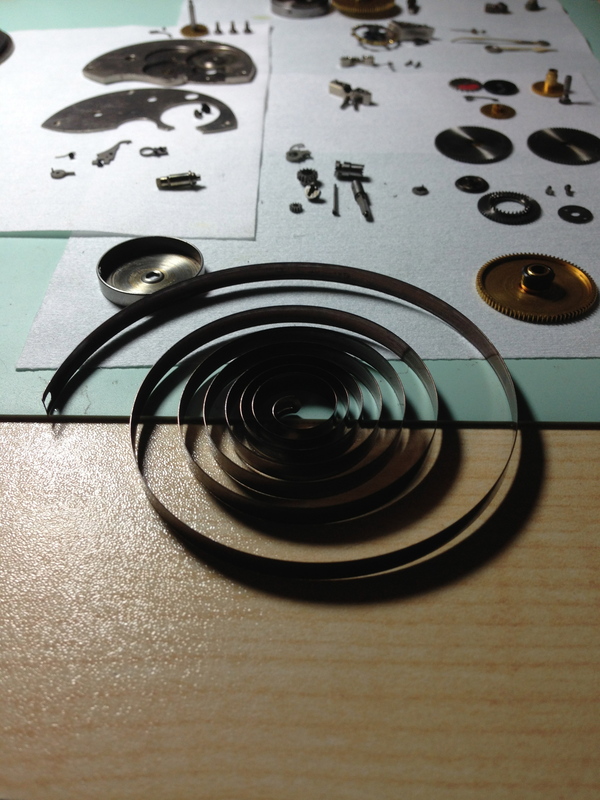 Their oversized parts are also great for learning about complications for the transition to smaller pieces. 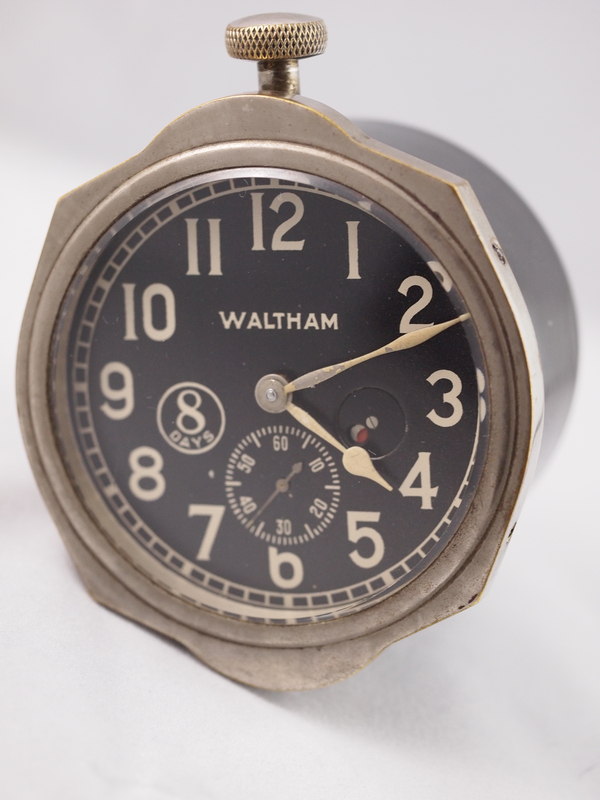 This vintage 8 Day Waltham Car Clock was two firsts for me. 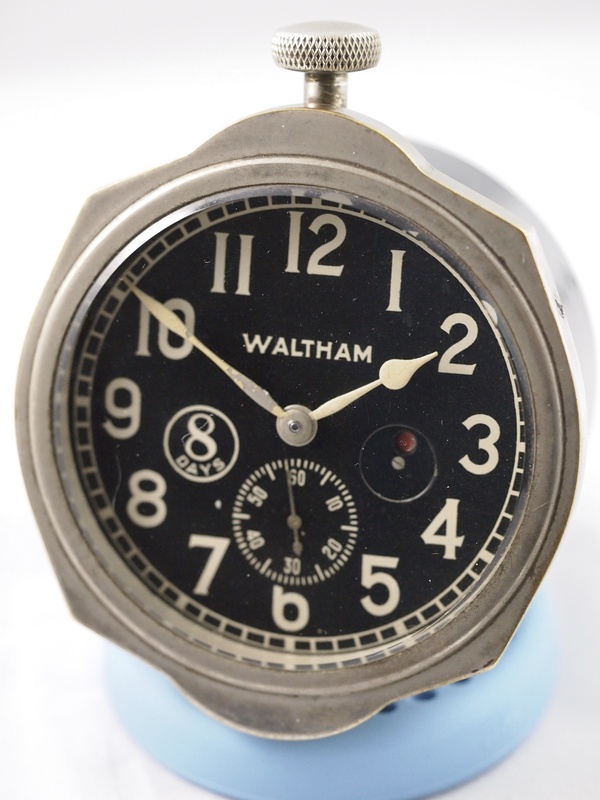 It was my first vintage Waltham, and it was my first power reserve. This clock came in a very heavy protective case that was meant to insulate it from the elements it would face serving as a car clock in 1914. 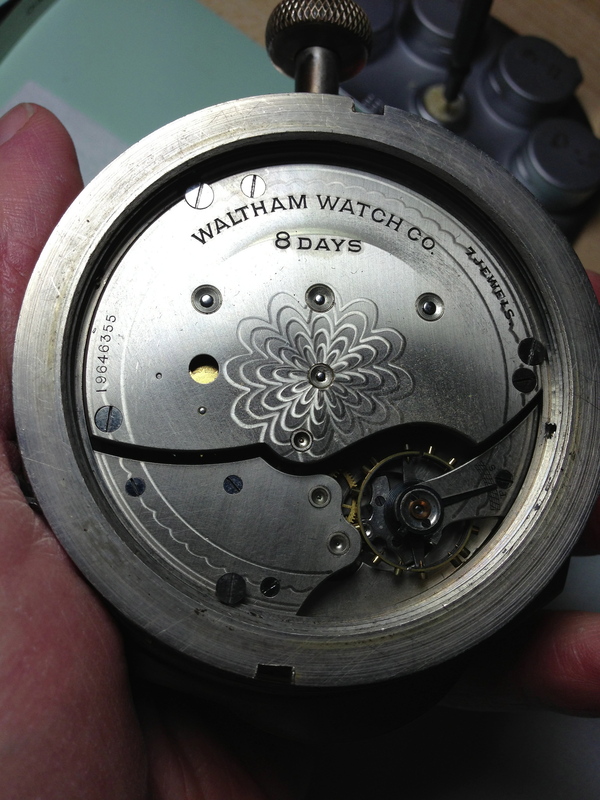 Once I finally figured out how to access the movement, I was enchanted with both the size and the decoration on the back. The movement ran but only for a short time. Generally this is an indication that a thorough cleaning is in order to clear away dried up grease and oil in addition to dirt and dust that may have crept in during the years. Once a cleaning has taken place, the parts can be inspected for the wear and tear that comes with being part of a low-jeweled movement. 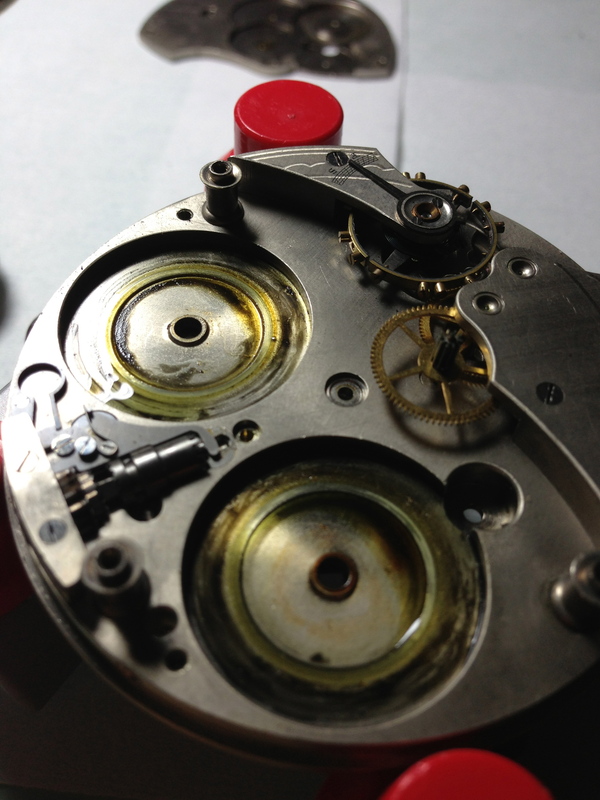 As I disassembled it I saw some of the telltale signs that this watch was hugely overdue for a service like the black grease under the mainsprings. Additionally, the balance moved sluggishly and with poor amplitude. 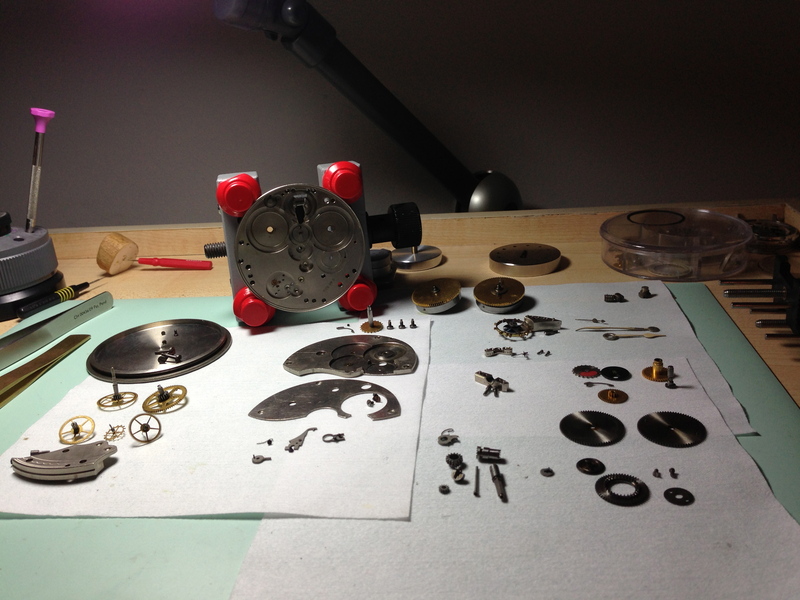 Once it was fully disassembled, I laid it all out and began cleaning and inspection. 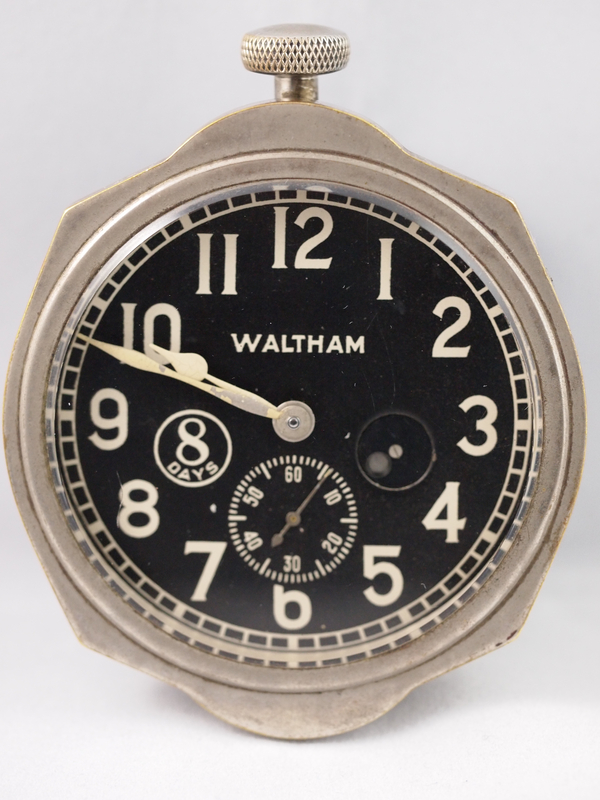 Waltham managed to achieve the 8-Day reserve by employing two mainsprings. So it wasn’t just one dangerous oversized spring I had to deal with, but two! My cautions about larger mainsprings not said lightheartedly. A while back, I had one of those humbling “learning mistakes” that has indelibly marked my respect for this component on watches/clocks. 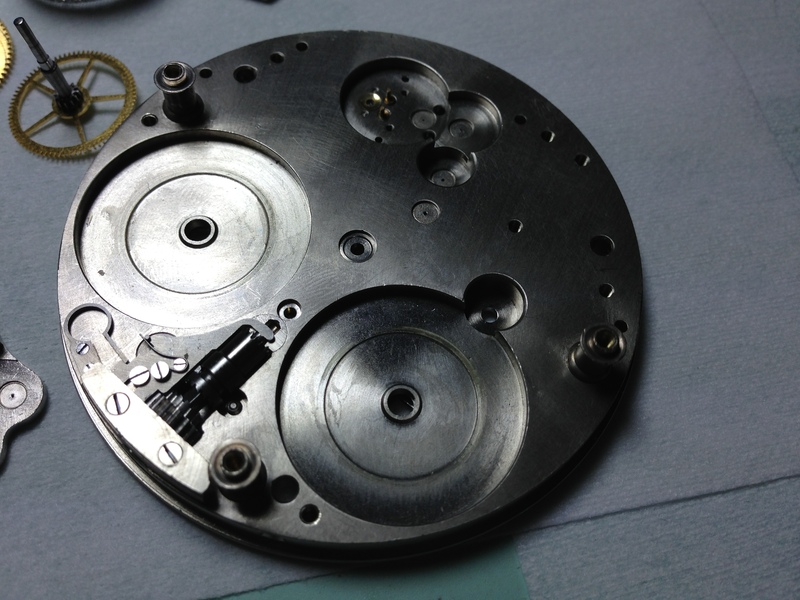 As I was uncoiling a fully wound 8-day Seiko wall clock with an exposed mainspring, the unwinding key slipped from my hand causing the mainspring to instantly release its energy. The incident left me with four bloodied and bruised knuckles and a week or so off the bench to heal. Needless to say, I am very careful taking larger mainsprings apart. All the parts looked good so I got the mainsprings greased and recoiled and began to put everything else back together. 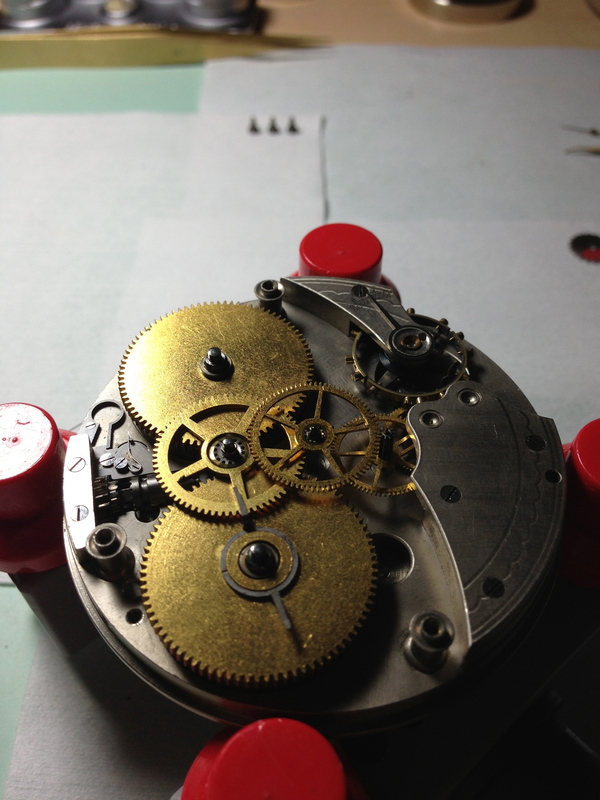 With all the pieces back in place, and the movement running like a charm, I regulated it before setting the wind indicator in place. There is a particular convenience to these clocks in that they do not need to be regulated to multiple positions, just the position in which you plan to mount it. The final test was to let the clock run for seven days to measure its long-term accuracy. It was during this time on the bench that I came to appreciate both its aesthetic and its application. As someone born during the digital age, the idea of a manually wound car clock was beyond comprehension. Quartz was king by the time I was around and as a result the idea of a beautiful mechanical timepiece being part of your car was long gone. With that also went some of the more detailed design work like the large oddly shaped steel case-front. At a certain point we traded convenience for craftsmanship, and while I couldn’t imagine having to wind the clock in my car, I’m sure the people who did so couldn’t imagine having to charge a computer, smartphone, or any of the other maintenance routines for our gadgets that came since. I am torn between the two. I love all my modern gadgets and all the benefits they bring (like this blog) but I also love that there are beautiful mechanical wonders like this clock from generations ago. I might be overly nostalgic, but I do not see someone in a generation or two being excited about restoring my iPhone or any thing else of the period that I might leave behind. This clock on the other hand is a beautiful relic from the turn of the century where it lived in one of the very early automobiles that would soon remake our world.